A pancake recipe from scratch : how to make Italian style pancakes. Pancakes in Italy are often used with left-over food. Here’s a quick and easy pancake recipe from scratch - the Italian way! Although Mardi Gras or ‘Fat Tuesday’ in Italy is a huge event, it’s not known as in other cultures as the day to eat pancakes. Because pancakes are more of a staple in Italian culture - they’re eaten right through the year. Traditionally for country people eggs, milk and flour were freely available - and that’s all it takes to make a delicious way of using up all kinds of foods as fillings. You’ll find lots of complicated recipes telling you how to make pancakes. 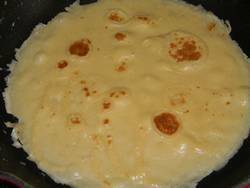 Our Italian pancake recipe from scratch does it the easy way - you’ll have great batter in a matter of minutes. This recipe is enough to make about eight. 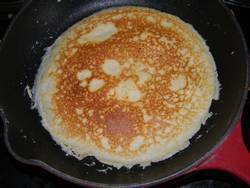 Pancake recipe from scratch : how to make. 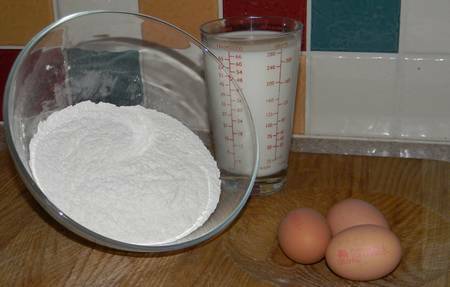 ✱ Put flour into a small bowl and make a small “well” in the middle. ✱ Drop the whole egg into the centre - no need to separate or beat it beforehand. 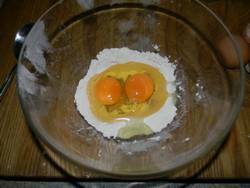 ✱ Using a hand blender mix the flour into the egg, adding the flour from the edges bit by bit. 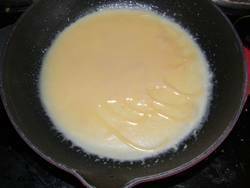 ✱ When the mixture becomes sticky, start adding the milk a little at a time. 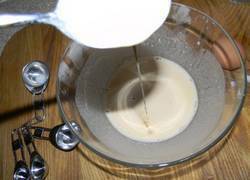 ✱ Keep beating the mixture for a few minutes; it will make a smooth, light-coloured liquid with tiny bubbles. ✱ Now put it to one side in the refigerator for twenty minutes or so. 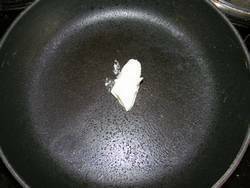 ✱ When you’re ready to cook the pancakes, melt a tiny bit of butter (less than a teaspoon) in a small frying pan. 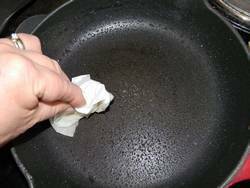 ✱ When it’s melted, take some kitchen paper and rub it around the pan. This will soak up any excess fat and makes a lower-calorie pancake. ✱ Now pour in enough batter just to cover the base of the pan. Don’t overdo it or your pancakes will be thick and heavy. ✱ Let it cook for about a minute. It will start to curl at the edges. ✱ At that point, either turn or - if you’re adventurous - toss it! ✱ Cook on the other side for about thirty seconds. ✱ Pancakes are best eaten straight away but if you want to feed everyone at the same time, leave them on a small plate covered with a cloth while you cook the rest. Now all that remains is to add your favourite filling and - enjoy! Try one of the scrummiest fillings we know - banana and chocolate pancakes will be an instant hit with the whole family - and they're ready in minutes! Want a more substantial Italian dessert? Try our delicious easy Italian Amaretto dessert recipe. If you want a real treat with your pancakes, this recipe for chocolate biscotti goes really well.